We are not forgetting about our little guests! Our very own playground, complete with swing set, trampoline and more, can be found directly behind the parking lot. About 100 meters away, at Duhner Kreisel roundabout, there is also a great new playground with wooden structures. Also mind the adjourning adventure golf course. Additional playgrounds can be found at the “ahoi!” water park, the beach house in Döse (with a pirate ship!) or at Wernerwald forest in Sahlenburg. The Fun Team has many more activities in store for our little guests, like a pirate treasure hunt or Wadden expeditions. In Wernerwald forest, directly at Sahlenburg beach, there is a great new climbing garden with many different tracks. In addition to these activities, you can always build sandcastles at the beach, visit the Wingst baby zoo, the Natureum Niederelbe or Zoo am Meer Bremerhaven. There are things to do for every age, in every weather. While we ship you to the seal colonies, we entertain your children with exciting pirate games and thrilling pirate stories, like the one of the infamous pirate Klaus Störtebeker, who used to haunt these shores back in the day. 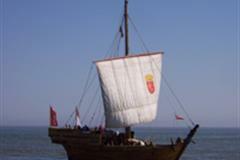 On the journey back, we will pass the “Kugelbake“ beacon, Cuxhaven’s landmark, and take you on a tour of the harbor. A true paradise for the little ones! Here, your kids will find all their needs fulfilled. 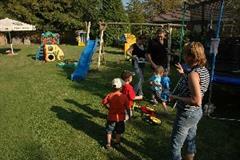 A shallow toddler‘s pool (30-40 cm deep), water slide, inflatable animals and squirt ducks. How about having fun in the tide pool, jumping through waves up to one meter high? Or trying to swim against the current in the flow channel? No chance of boredom! The 65 meter water slide is great fun for all ages – tight turns and finally a big splash in the water! One more time! Parents can relax on the side or in quieter waters, keeping an eye out for their little water rats. Sanitary facilities with diaper-changing tables are provided. 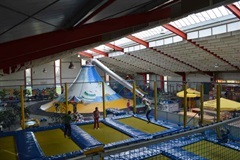 The play barn in Otterndorf (Otterndorfer Spiel- & Spaß-Scheune) is full of play options and offers a nice atmosphere. It is situated “achtern Diek” (behind the dike). 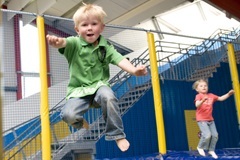 From going fast on the super slide or bouncing on the trampoline, there is so much to do here. 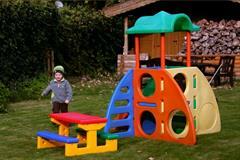 The adventure playground, beach and play barn are all in close proximity to each other. Directly at the water’s edge is the Otterndorf surf school, offering canoes and pedalos for rent in addition to its surfing classes. The water ski facility Wakegarden was opened in 2012 and extended in 2014. The leisure center "Achtern Diek" can be found directly behind the dike, next to a freshwater lake, ideal for swimming. It also offers a beach volleyball court, skate park, large slides, climbing structures, a carousel, a zipline and much more. A good time for all ages, guaranteed. And for the bravest, a new bungee trampoline facility awaits.